*Application can be accessed online at the CFWV website when it becomes available with a FREE CFWV account. Be sure to sign up early so you can become aware of the requirements and due dates. There are minimum GPA, Core Class, and ACT/SAT requirements. 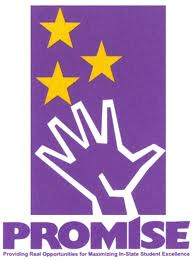 Students should read the complete list of PROMISE Scholarship Eligibility Requirements. This list also outlines eligibility requirements and application procedures for home-schooled students. The core grade point average includes all core courses, but does not include electives. GED/home-schooled students must attain a specified minimum score on the GED for scholarship consideration. ACT/SAT scores must be from a national test administration and cannot be combined from multiple test administrations. In addition, the ACT and/or SAT writing portion will not be used in calculating minimum combined scores. OCTOBER 1 - The FAFSA will be available on www.fafsa.ed.gov . In order to be considered for the PROMISE Scholarship, the Free Application for Federal Student Aid (FAFSA) must be received by the Federal Student Aid Processing Center on or before March 1 and meet the conditions for processing. APRIL- Initial award letters are mailed to PROMISE Scholars. JUNE SAT - Last date to take the SAT to establish scholarship eligibility (reasoning test only). Scores will not be accepted for any SAT taken after this. JUNE ACT - Last date to take the ACT (national test only) to establish scholarship eligibility. Scores will not be accepted for any ACT taken after this. Scholars are not required to reapply to the scholarship yearly. Scholarships are automatically renewed if students meet the renewal requirements at the end of a year of enrollment. Scholars may use subsequent summer sessions at their own cost to obtain GPA and/or credit hour renewal requirements. Eligibility for renewal is determined by the scholar's institution at the end of a year of scholarship utilization, based on first-time semester enrollment. For example: Scholars enrolling in their first semester of college during the fall semester will have the fall, spring, and summer semesters to meet the renewal requirements. Scholars enrolling in their first semester of college during the spring semester are considered "off track" and will have the spring, summer and fall semesters to meet renewal requirements.